Do you think that autonomous citizen engagement is needed for renewal of the "social contract"? "In a sentence, community social planning is about practicing good citizenship. We benefit from being a member of the community. We therefore have an obligation to contribute to the well-being of the community." No doubt, election periods are bringing excitement to social and economic conversations. We get interested in dedicated women and men putting themselves out as candidates to support expression of different views on the societal and policy issues. Our team gets energized for sure by bringing those important issues to the forefront through all-candidates meetings where citizens get together as equals to define priorities for future councils and governments and put important issues on the public agenda. However, the time in-between elections is equally important as ongoing opportunities arise for citizens to give their input in consultations, sit on advisory bodies, and work together with elected officials and other community partners to fulfill common goals. We believe that community-led citizen engagement is a necessary complement to government-led consultation and advisory initiatives. Community-led civic engagement reveals paths that go beyond fact finding. They make possible the collective action through deliberation and action planning inclusive of diverse experiences and voices. A social contract is not only an agreement among people in a society, it is the work that people do together to create opportunities and increased quality of life for all. Municipal Elections 2018 - Meet the Candidates! 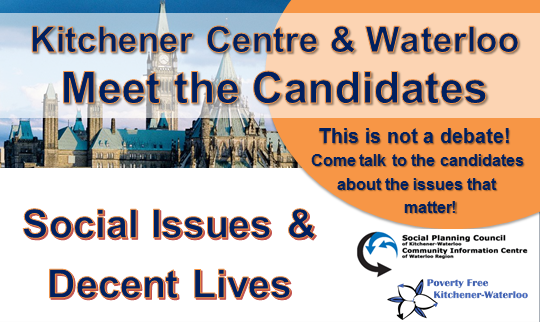 Social Development Centre WR has oranized meet the candidates in Kithcener and Waterloo together with the Grand River Unitarian Congregations, KW Peace, Alliance Against Poverty, Dialogue Xchange and Disabilities and Human Rights Group. Review the chart if you are not sure what the responsibilities are of each of the two levels of municipal government. "In debates - and there will be lots of them - the audience listens to political candidates argue about issues chosen by a moderator, and tries to figure out who argued best. That's not what this is. Read more about 2018 Provincial Election! We carried on with the unique tradition started by Trudy Beaulne by hosting three forums, Kitchener Centre, Waterloo and Kintchener Conestoga, where people met their candidates face to face. As usual, it was not a debate, but a conversation supported by several organizations active in the areas of affordable housing, healthcare, income security, environmental justice, and democratic reform: KW Peace, Fair Vote WR, Divest Waterloo, KW Transition, Alliance Against Poverty, Basic Income WR, Disabilities and Human Rights, Renters Educating and Networking Together. We believe that informed and engaged citizens who have a chance to meet the candidates face to face turn out in greater numbers to the polling stations and stay in touch to work with them in-between elections. Read more about 2015 Federal Election! We had a record turnout at the meet the candidates discussions this 42 general election in both Kitchener-Centre and Waterloo electoral districts! We ensured all the people who were courageous and took part in the round table discussion regarding important social issues that we will follow up with the elected Members of the Parliament and that we will continue to monitor and bring all the issues to the forefront of our public conversations. Here you can read what the Liberal Party of Canada said it would do about poverty and social issues and how it relates to what was important to the people of our communities. We have three Liberal MPs elected in Kitchener Centre, Kitchener South-Hespler and in Waterloo. Kitchener-Conestoga has re-elected the Conservative MP, Harold Albrecht. Let us know if our comparison of community priorities and the Liberal government priorities is useful for your work or advocacy? shared "how to" guide for participatory all-candidates sessions and more.